I've been less than DIY inclined recently. I've done almost no work around the house and the work I have done is pretty basic but something has been really bugging me so last week I decided to try and tackle it... try being the operative word. Our front porch situation had become an issue. 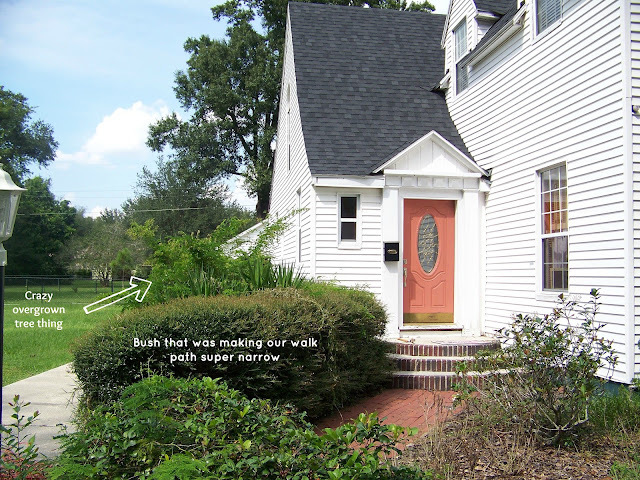 Our hedge was way overgrown and impeding on our front walk in such a way that it was uncomfortable and our tree/bush thing had grown so much it looked like it had a bunch of awkward ears and those ears would scratch against the car if we drove that far down the driveway. We also have a vine that is basically trying to take over the entire area. I can honestly say I did not remember how bad hornet stings are. I got one on my hand and my shoulder and it took a fair amount of ice and baking soda/water paste to stop the burning. But, if you couldn't already tell, since I've numbered my fails, the hornet stings did not put an end to this project. I decided, after checking on the dogs and observing the hornets from a distance, that if I stayed on the walkway side of things, I could trim the hedge without dealing with the hornets. So, I got our electric hedge trimmer and our extension cord and got to work on the hedge. Once again, I got about 80% done when fail #2 occurred. I'm still not exactly sure how this happened but I'm going to chalk it up to rushing because it started drizzling. The extension cord which I had successfully held out of the way for about a half an hour at this point slipped out of my hand and became one with the hedge... the part of the hedge that I happened to be trimming at the time. I managed to cut the extension cord and a little cut in an extension cord results in a useless extension cord. Now, I could have gone and grabbed another extension cord, but I learned at a very early age that if you are having this type of day, it's best to just pack it in and do nothing even semi dangerous for the rest of the day (a broken leg was the result of ignoring this at one point) and about 2 minutes after I got everything put away and the dogs and myself back in the house, it started pouring. To sum up, as a result of my efforts, I now have two bushes that still need a good amount of trimming, two hornet stings that turned into very itchy rashes (which are almost all gone), a destroyed extension cord and a bunch of neighbors that I'm sure think I'm absolutely nuts. Definitely not one of my finest days and you may not see an after picture until we figure out how to get rid of all the hornets but it was nice to get something around the house accomplished... even if it's not finished.